Hoplophoneus mentalis skull replica is cast from original specimen. Oligocene Saber tooth Cat. South Dakota. 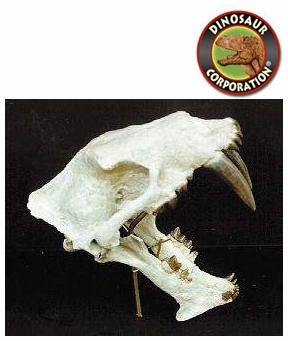 Hoplophoneus is an extinct genus of mammal that is often referred to as a Saber-Toothed Cat. It was one of the earliest ancestors of the cat family (The Felidae). Hoplophoneus was a member of the family Nimravidae. Hoplophoneus, though not a true cat, was similar to cats in outward appearance, though with a robust body and shorter legs. The largest known specimen was examined by Sorkin (2008) for body mass and was estimated to have a weight of 160 kg (350 lb).